Direct mail is (hands down!) one of the most effective methods for reaching your customers. For some of us, this is great news. For others, not so much. For example, your sales team may absolutely dread direct mail campaigns. Why? Because they’re seen as time-consuming and tedious… and they’re not far off. Stuffing envelopes and gathering addresses is extra work for your sales team, but the end results can be powerful. When a direct mail campaign isn’t created strategically, you’re just shouting into the wind. You know you’re making noise but are you really reaching your prospective clients? Not likely. Well, yeah, obviously. But whether you’re running a postcard campaign or using self-mailers, your customer address is important. Handwritten addresses or addresses with a handwritten look offer a personal touch. Take time to update your lists after each campaign so your customer data stays fresh. Typos and misspellings indicate you’re a hack, so take the extra time to make sure your data is right. An alternative to renting traditional address lists is to use the USPS Every Door Direct Mail program. The EDDM allows you to target customers geographically by carrier route and demographics (income, household size, etc.) rather than individual mailing addresses and information. This low-cost option is great for businesses looking to target local customers that live in their zone. With direct mail it’s alllll about the packaging. Whether you opt for a postcard, a traditional letter campaign or a three-dimensional package, your mailing needs to stand out from the letters-in-the-mailbox crowd. Oversized postcards are a great, economical option. Coating is key to providing a finished, professional look for your mailing. Have you ever wondered why great printing projects stand out? It’s because of the different coatings – matte or gloss – that add the final polish and literally seal the deal. The right finish on your direct mail piece will enhance your message – from bright and shiny gloss to soft and warm matte. People often judge you and your offer based how your direct mail piece feels in their hands. Branding, logos and eye-catching visuals will help your direct mailing “speak” to your audience. You’ll want to use your specific branding colors (usually designated by a PMS or Pantone number). Use consistent fonts that align with your brand guidelines. You may also want to include other printing touches to set your project apart and appeal to your customer’s senses. For example, letterpress, foil, 3D and embossing will take your next direct mail piece to the next level. There’s even scented coating, so your customers can smell your product before they buy! Catch your customer’s eye, nose and tactile senses—it’ll give them pause, and time to discover your message. While the message is, of course, the heart and soul of your next direct mail campaign, spending hours crafting lengthy prose is a waste of time—generally you have only a moment to capture your customer’s interest and attention. You want to include a SINGLE CONCISE MESSAGE in your mailing. Your message should speak to your customer directly. Focus on what matters most to them. How will you help them resolve their problem? Remember, when it comes to copy, less is better. To excel at personalized messaging, it’s so important to start with a clean mailing list, segmented by customer type. You may want to break your customer base down by demographic, last purchase—or even specifics like dog ownership! These important bits of information let your customers know you really understand them. They’ll see the message you’re sending was crafted just for them—and your note will resonate. 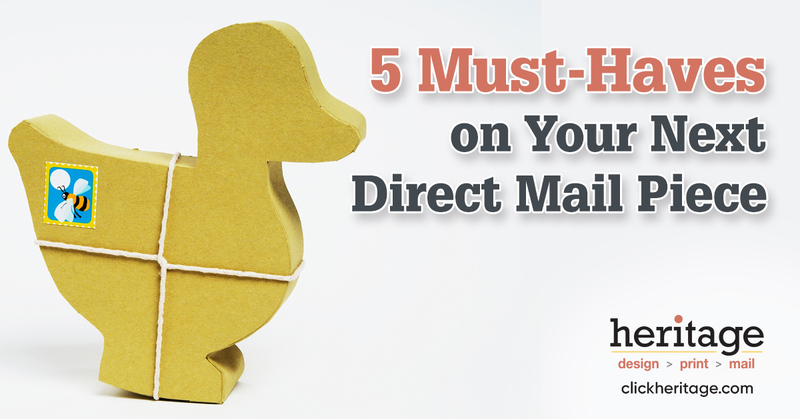 The single most important component of your next direct mail piece? Your call-to-action! Yet, so many marketers forget this critical piece (or even downplay it) in favor of promoting awareness. Don’t make this mistake. Tell your customers where to go and what you’re going to do for them. Pick a single call to action to follow. Get your CTA to stand out with typography. You want to help your customers ACT as easily as possible. Remember, your goal is to help solve their problem! Creating your next direct mail piece so it stands out from the crowd is easy when you break it down into the core components. Need help? We can walk you through each step, from cleaning your mailing list to crafting the perfect direct mail piece design. Learn more about mailing.